MQSeries.net :: View topic - Multi Hopping -- why are these definitions not working?? MQSeries.net Forum Index » Clustering » Multi Hopping -- why are these definitions not working?? Posted: Thu Jun 14, 2018 12:21 pm Post subject: Multi Hopping -- why are these definitions not working?? On QM2, I alter the definitions to below and it stopped working. Msgs land in QM2 (gateway qmgr) dlq with the error MQRC_XMIT_Q_TYPE_ERROR. Could someone tell what's the flaw in my definitions? The dead-letter-header (DLH) of the message in the DLQ will specify the name of the "XMITQ" that is not an xmitq. Post here the complete DLH. This is all the DLH has. It doesn't say anything about xmitq. 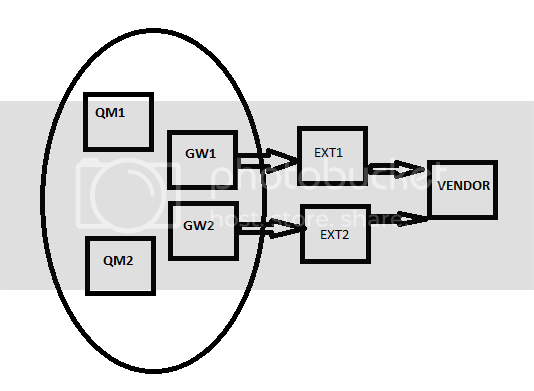 on QM2, i have the xmitq "DEFINE QL(QM3) USAGE(XMITQ)"
Well you are making a mess of the setup. You are completely neglecting cluster routing but then having a cluster wide alias?... Not a good fit. Either do point to point routing or do cluster routing. Refrain from mixing both until you master the subject of default routing much much better. What I'm trying to achieve is this, are my definitions correct? These definitions are not correct. On GW1 and GW2 you need to add the XMITQ to your QR(EXT). The same way on EXT1 and EXT2 you need to add the XMITQ to your QR definition. I did, updated the post. And defined required sdr-rcvr channels too. is defining 2 QM Aliases on a qmgr valid? Your problem is the missing xmitq and the destination is not in the cluster. Amqrmppa is the RCVR channel end attempting to resolve the xmitq name, and failing. Yes, you can have many, many queue-manager aliases (QRemote) definitions in a qmgr; however, you cannot chain them together endlessly. Similarly, you cannot (successfully) have a QAlias resolve to another QAlias. FJ's solution above combines your multiple, chained QRemote definitions into a single QR def. Thanks guys. I got the below 2 setups working. With both setups, the messages are equally distributing across both the GW qmgrs and reaching the desitnation (VENDOR) qmgr. But when I try to "dspmqrte", it doesn't show the complete message route, it finishes after exiting the GW qmgr. Is it not supposed to show the activity until the msg reaches the TO.VENDOR.QL? AMQ8653I: DSPMQRTE command started with options '-q TO.VENDOR.QR -m QM1'. AMQ8659I: DSPMQRTE command successfully put a message on queue 'SYSTEM.CLUSTER.TRANSMIT.QUEUE', queue manager 'QM1'. AMQ8674I: DSPMQRTE command is now waiting for information to display. AMQ8666I: Queue 'SYSTEM.CLUSTER.TRANSMIT.QUEUE' on queue manager 'QM1'. AMQ8666I: Queue 'EXT1' on queue manager 'GW1'. --- After this line, it takes about 2 mins to display the last line. Is this how it works? or is there something wrong with the setup? AMQ8652I: DSPMQRTE command has finished. So, the route msg arrives on GW1's EXT1 xmitq. Is the sdr channel from GW1 -> to EXT1 in RUNNING state? Does the sender channel specify EXT1 as its xmitq? Does the EXT1 qmgr object have trace-route enabled? All the channels are defined and the msgs i put using amqsput do reach the local queue on VENDOR qmgr. I just don't understand why the dspmqrte doesn't show it. In order for dspmqrte to provide a complete routing picture, there needs to be sender-receiver channels AND queue-manager aliases back from intermediate and destination qmgrs to the originating qmgr. AMQ8666I: Queue 'EXT2' on queue manager 'GW2'. AMQ8666I: Queue 'VENDOR' on queue manager 'EXT2'. AMQ8666I: Queue 'TO.VENDOR.QL' on queue manager 'VENDOR'.